« One for the calendar! I’m slowly starting to fill up my shop inventory by creating more stationery products. And I always like doing the markets because it gives me a chance to get out there and show my customers my new creations. Most of the time it pleases them to see what’s new and they like to look around the table, feeling and touching things. 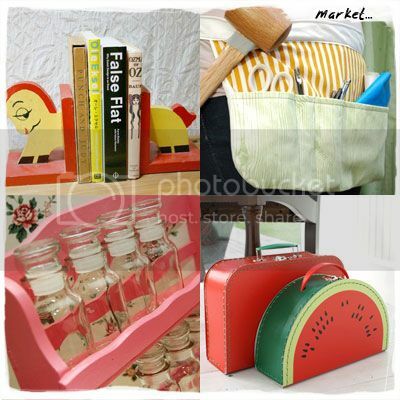 Here’s my Wednesday wishlist for some cool things to make any market display table fun and exciting! Great for displaying Little Mo notebooks! A cute way to display art prints. This entry was posted on Tuesday, June 16th, 2009 at 10:53 pm and is filed under Wednesday Wishlist. You can follow any responses to this entry through the RSS 2.0 feed. You can leave a response, or trackback from your own site. Well it’s 2 minutes till Wednesday – good timing! Loving those little suitcases, they are cute! Nice list Little Mo’! Oh these are all great! I want to start doing a market so I can steal your ideas! These are so lovely Helena! I love your blog by the way ….and your fiance is really dishy! I still really want that spice rack. I think I am going to have to start scouring op shops to find one. Mmm spice rack-y goodness.